Life is often messy. God makes provision to help us move beyond our messes but often our first instinct is to hide, deny, ignore, or run from them. Yet it is in the middle of our mess where mercy shows up and offers a safe place to process our struggles, imperfections, doubts, and fears. Then with mercy by our side, we are able to move on and experience the grace and freedom God intended. 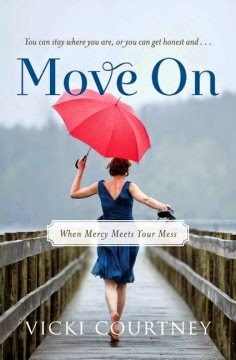 Once we face our messes, God, with his sweet mercy, can help us to get real, deal, and truly move on. This book is jam packed, from cover to cover, with just plain ole' awesomeness. There are personal stories, excerpts from books and relevant Bible verses to showcase the message of mercy in every day life. Vicki is honest and straight forward, which I love. She shares her own stories honestly, even when they're messy. Often, as Christians, we judge though we should not. Myself included y'all. Whether that judgement is in silence or aloud, we are guilty of doing so from time to time. How many times we don't extend grace to those who need it the most. But yet, we expect grace to be given back to us. Vicki goes on to show that mercy is so freely given and to find the light in every darkness. This was a great read and I would highly recommend this book to anyone, no matter your age or stage in life. But especially to those of us who feel as though we have some sort of shortcoming. This book will challenge you and, if you let it, this book will change you.